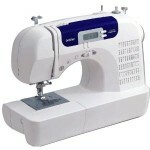 $154.99 for Brother CS6000i Computerized Sewing Machine on Amazon.com with Free Shipping | A Savings WOW! One good way to save money is to sew your own clothes and sew your own gifts. Amazon.com has a wonderful deal on this Brother CS6000i Sew Advance Sew Affordable 60-Stitch Computerized Free-Arm Sewing Machine. It’s only $154.99 with free shipping (normally $449.00). That’s a 65% savings! As with any deals on Amazon.com, prices can change at any time and at a price like this, it may run out of stock, so if this is a deal you like, be sure to get it now. Get your Brother sewing machine on Amazon.com today! Thanks for sharing, this would be a perfect gift for my mother. She loves embroidering quilts pillowcases, she said she loves to put them personal touches and the outcome will be based from her creative mind. 🙂 I’ll be purchasing this for her. I’m sure she’ll love this item!